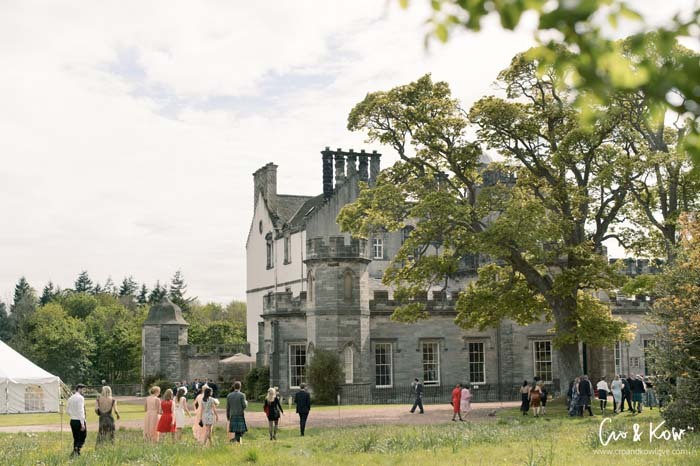 If you’re dreaming of a summer wedding, you’ll enjoy this story of Zitlali and David’s Scottish wedding at Winton House, a Scottish Renaissance castle just outside Edinburgh. Having crossed paths with a knowing look many times in the grounds of Glasgow University, we were eventually introduced by mutual friends on a night out. After several dates in Glasgow’s West End, I eventually caught the girl I’d only previously known as “hot library girl”! After 9 years together, I eventually proposed on a holiday in New York. Following a few days of trying, I took to one knee in the beautiful setting of the roof terrace at the NYLO hotel. An evening we’ll never forget! What inspired the Garden Party theme? The Garden Party theme was inspired by an outdoor wedding we attended in South Africa. The castle’s 17th century walled garden was in full bloom and was the perfect spot for our Garden Party. Fortunately, the weather was fantastically hot on our wedding day, 23rd of May. How did you create the Scottish ambience? While David and I now live in England, we’re both originally from Edinburgh and our hearts still belong back home in Scotland. It was never questioned that we both wanted to get married in beautiful Edinburgh! We wanted to take the Garden Party theme and add a Scottish flavour, reflecting our Scottish roots and for the benefit of our many international guests. The castle, Winton House, with its beautiful grounds, was chosen as our venue. 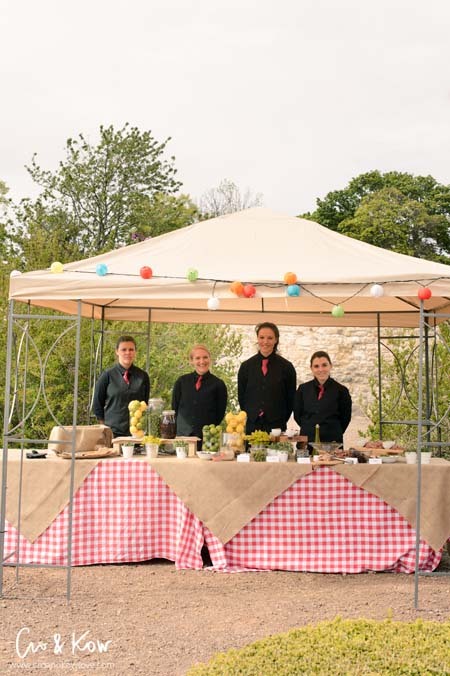 We added hay bales with tartan rugs, wheelbarrows full of iced beer (‘beer-barrows’), Jazz on the lawn, hula-hoops, croquet and football to the Garden Party, and guests tucked into delicious antipasti on personalised wooden chopping boards. (Both our dads stamped our initials onto 150 boards which doubled up as wedding favours!). The castle dungeon was transformed into a whisky tasting room. Several single malts from varying parts of Scotland were laid out with tasting glasses so everyone could indulge! This room with its fifteenth century vaulted roof turned out to be a huge draw during the evening reception! Why did you choose Winton House? We visited 17 venues within the Lothians before we came across Winton House – our final venue on the list! We had a vision of what we wanted the day to look like and with over 100 guests travelling from outside Scotland (and many from outside the UK), we wanted our guests to feel that they were attending a unique Scottish wedding as opposed to a marquee that could be anywhere in the world. Must have a Scottish feel. Large beautiful grounds for the Reception drinks. Be able to use of the venue indoors. Within 45 minutes of Edinburgh. Ideally some rooms for close family and friends to stay the night. Winton House was the perfect venue; an imposing building but retaining a homely feel. Beautiful architecture and priceless artwork around every corner, yet a cosy feeling in every room. The grounds offered many settings, from terraced gardens with a lake view to a walled garden looking towards the House. 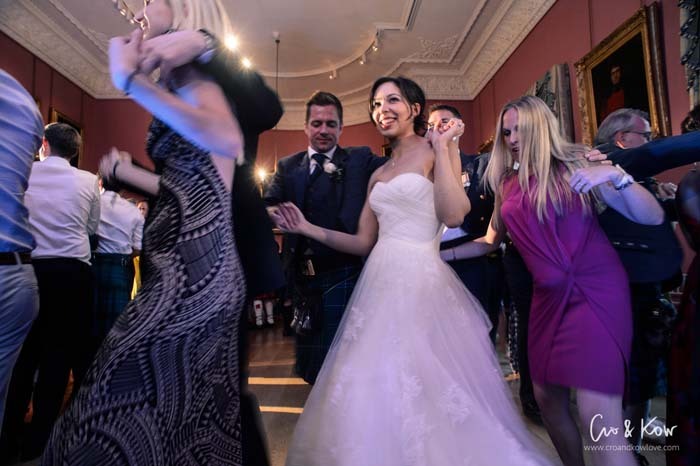 The walled garden suited our vision of a garden party reception and the indoors of the house offered plenty of space for dancing as well as allowing our guests to make themselves at home. How did you choose your wedding dress, Zitlali? I visited 8 different bridal boutiques before I found the one! I started to worry that I would never find the perfect dress until I met the wonderful Kavelle. Her boutique, Kavelle Couture, has such a luxurious feel – I knew it was going to be a special experience. After discussing what I was looking for, Kavelle picked out a handful of dresses for me to try on. As soon as I tried on the first one, I had the WOW feeling! Kavelle is so patient and understanding and has a great eye for helping you choose the perfect dress. And tell us about the men’s outfits, David? I opted to wear my own kilt on our wedding day. The kilt had been through many of the major events in my life and I thought it fitting that I wear it on the most important of days. The Green Douglas tartan also lends itself well to many jacket options. I had a bespoke tweed jacket made at Houston’s and wasn’t disappointed. The petrol blue tweed complemented the tartan perfectly and created a very refined yet modern look. The tailor-made look of the jacket also added to that special wedding feeling! Being an Officer in the Royal Air Force, I’m lucky enough to be able to use a sword party. Having eight men dressed in full No.1 RAF uniforms with accompanying swords really added to the occasion. However, they attracted more attention than the bride from the dozens of tourists on Edinburgh’s Royal Mile! What advice do you have for other brides and grooms? We had such a clear vision of what we wanted our wedding day to be like but also realised that we needed the help of all our suppliers, friends and families to help create the day so we put together a ‘Lookbook’ to illustrate every section of the day. Winton House and Appetite Direct (our caterers) were incredible at recreating our Lookbook and delivering beyond our expectations! While we spent a huge amount of time planning and, at times, it was very stressful, we had to remember the most important part is to take it all in and enjoy celebrating with your closest friends and family. They’re all there for you; they won’t really pick up all the little details, so don’t stress out and just enjoy the whole experience! Fennel and Milano Salamis, Sliced Prosciutto. Nocarelli, Marinated Green and Kalamata Olives. Bocconcini Mozzarella, Sliced Hard Cheese. Selection of Fresh Breadsticks (Sesame seeds or Cheese), Grissini (Crunchy), Either Olive Foccaccia or Ciabatta and Walnut and Raisin Loaf. Roasted Almonds – Cream Cheese Stuffed Peppadew. Selected Involtini with Aubergine, Courgette, Ricotta and Sun-touch Tomatoes – Dips – Pesto, Tapenade and Hummus. To Start – Velouté of Thai Butternut Squash with basil oil and coconut. The Main Event – Duo of lamb: roast lamb and a lamb beignet with gremolata and pea shoot salad, potato galette and spring greens. The Finale: Duo of desserts: Lemon Tart and a Chocolate and Salted Caramel Mousse Cup. Haggis pies topped with mash (these went down a storm!). Fish and chips served in cones. 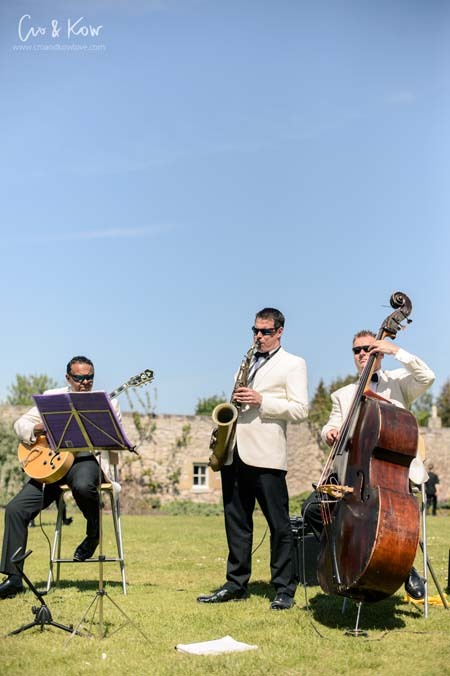 The Ritz Trio provided the perfect musical accompaniment to our Garden Party setting. Their lively, yet subtle set was the perfect backdrop to allow our guests to eat, drink and dance the afternoon away with a fun, sophisticated edge. They certainly looked the part and blended in perfectly with the chic garden party look. Our first dance was ‘Brown Eyed Girl’ which was sung live by the band, Callanish. We wanted an upbeat first dance and a real defining moment of the wedding for both of us was hearing the entire crowd singing along (“Sha la la la la la…”) as we danced our way around the room. The song proved to be a great choice and set the tempo for the evening’s dancing! We found choosing a wedding band one of the major challenges but we were exceptionally pleased when we found Callanish. The ability to do both up-beat modern ceilidh and contemporary music was a must and they struck the balance just right. We wanted the bulk of the ceilidh at the start before moving onto livelier numbers as the night progressed. The band seemed to judge the guests well and, judging by the number of people on the dance floor, the transition between them was seamless. Although it sounds cliched, our wedding day was so varied and ran so smoothly it is too hard to pick out any one really memorable aspect. From the hundreds of tourists greeting us outside the church to the toe-tapping jazz in the beautiful sunshine; from the multi-national whisky room to everyone singing along to the first dance – the whole day was truly unforgettable and was most certainly worth every ounce of effort in the planning! Ceremony Venue – The Canongate Kirk, Edinburgh. 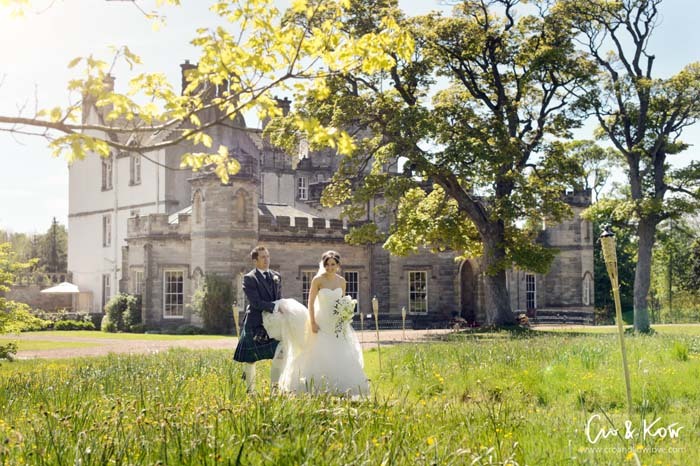 Reception Venue – Winton House, a 500 year old Scottish Renaissance castle just outside Edinburgh in East Lothian. Winton must be one of the most romantic wedding venues in Scotland. Photographer – Crofts & Kowalczyk Photography. We wanted our photos to look natural and encapsulate the magic of our day without being too ‘arty’. We wanted our photos to be full of natural bright light and Crofts and Kowalczyk manage to do this perfectly. Filmmaker – Jeff Wood Visuals. What we loved about Jeff Wood’s videography was that it made your wedding look like a Hollywood movie. He uses cinematography techniques to blend the sounds of your wedding – laughter, chatter and footsteps – with the background video music. Makeup Artist – Lauren Gollan. Wedding dress – The Pregola by Pronovias from Kavelle Couture. Groom’s outfit – Houston Kiltmakers, Paisley. Stationery – Bespoke design from Platinum Graphics. Reception Music – The Ritz Trio. Cake – The Bride’s Father. Car – Majestic Wedding Cars. Thanks very much to CROFTS & KOWALCZYK PHOTOGRAPHY for letting us use their excellent photographs. Many thanks also to Scotland’s wedding blog WE FELL IN LOVE who contributed some of the content for this wedding feature.